Yesterday afternoon I got out for about an hour and a half. I decided to go gold hunting in the local sports fields. I have hunted these sports fields for many, many hours. I only dug two high tones during the hunt which both ended up being tent stakes. Now I dug 30-40 mid and low tones. I managed a nickel, 15-20 pulltabs, and 15-20 pieces of foil. There are very few good repeatable signals left in this modern sports field. As I was finishing up and headed back to the truck I had an idea. I have no idea why I hadn’t thought of this before but what can I say. The parking area at these sports fields are approximately 3 soccer fields worth. I decided to try digging in it. I was surprised that it is about an inch worth of loose sand/gravel and then an extremely dense layer of crushed asphalt. I turned the sensitivity down on the detector and got to swinging. Over the next 10 minutes I dug 4-5 coins out of the loose stuff. My advice is to go ahead and detect these gravel lots. You never know when someone lost a ring while fiddling with keys or pulling off their gloves. I guess gold fever is setting in. Speaking of gravel, rocks, and gold be sure to check out High Plains Prospectors for all your treasure hunting needs. It isn’t fun to get ran over… But maybe you’ll learn something. I haven’t found anything super super cool lately so I thought today I would tackle a different aspect of the hobby. Last night I was invited to play snooker with a buddy of mine. He is a phenomenal snooker player (champion actually). Right away he pointed out some of my shortcomings. He also pointed out that the tables pockets were tighter than a standard snooker pocket. I started the evening thinking we would be playing for a couple of hours. The first couple of games he tackled some shots he normally wouldn’t. This gave me an opportunity. I didn’t succeed. I couldn’t get comfortable with my stroke and mentally I wasn’t in the game. This is where I want to bring detecting and so many other hobbies into focus. I have mentioned the mental game of detecting in the past. My buddy quickly got settled in and proceeded to run me through the ringer for 4 hours. It was fun to watch but man I wish my game had been on. I have personally seen people (myself included) fall apart mentally on a billiards table and in the detecting field. If you sit at home and watch people pull old relics, coins, and gold jewelry all day it will look easy. If you sit at home and watch World Champion snooker players you’ll say that it looks easy. So my goal for the next few hunts is no matter how slow or unproductive it gets I want to keep my mental game strong. Don’t get discouraged if you are new to something and fail. It happens to the best. As we were winding down for the evening my buddy registered to play in a snooker tournament 500 miles away this weekend. I wish I could go to that tournament and just talk to advanced players and see how they keep it together mentally. Many times in snooker it is a simple mental decision that wins or loses a match. Can the same be said for detecting? I believe it can. I have wondered around for hours when my mind wasn’t on detecting. Anyways, It’s obvious I don’t have solutions to the problem but I’m merely pointing out the parallels I’ve seen between a couple of hobbies I love and the way our minds work or don’t work when needed. When it comes down to it I believe if you don’t push yourself you won’t learn and advance. If you take time to detect with others you may learn from them. If you play snooker with a national champ I can promise you that you will learn something as long as you open your mind. I think this is the most fun part of socializing within hobbies. Talk to others about their game and listen when they answer! On a more fun note Pulltab Miner and I are getting ready to jump into something that will probably test us both mentally and physically. I hope I can keep my head in the right place! Well after 3 evenings of battling with the hot water heater, taking down christmas lights, and taking care of all my other family duties I was ready for some detecting this afternoon. I decided to hit a site I detected a month or so again. Last time I was there Pulltab Miner and I both found Indian head pennies. Well today started off with the first target being a headstamp. This site is a iron infested mess. It became evident while digging some of the targets. It was easy to pull a square nail or two before finding the somewhat decent sounding signal. Anyways I was joined by another hunter and we had just got done digging a target when we saw a gentleman crossing the fence headed our way. As he approached he asked what we were doing and I told him. The next question was do you have permission and I said yes. He then informed us that he owned it and asked us to leave. Now here is a little back story. While researching this site I learned that it was owned by a family trust. I called the number on the GIS website and was told I needed to talk to another person to get permission. I talked to him and was granted permission. I explained this to the owner and he understood. He was nice about asking us to leave but I still don’t fully understand the reasoning. This is just another instance when I have gotten all permission I thought was needed only to get shut down. Now I’m not totally disappointed because the site hasn’t produced much but I do know the potential is there. 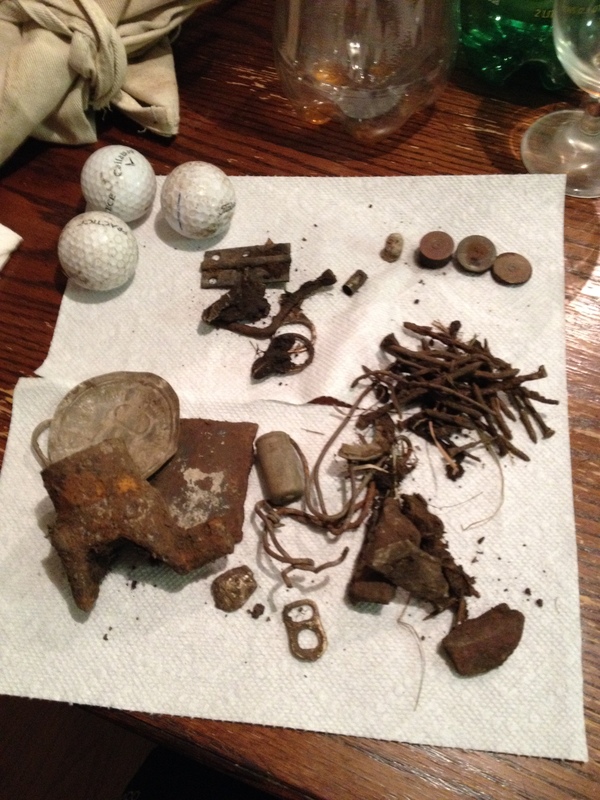 Anyways todays hunt didn’t produce one coin but I did manage to find a bunch of metal.. The most interesting finds were the headstamps. Now I believe that all of these shells were from 1910-1930. This tells me that the coins should still be in the same area. The school was on the 1885 plat map and the 1905 plat map. The town falls off the map shortly after that and a neighboring town blossoms. I’m guessing that this field got purchased with the school house and then turned into a recreation field. Well, I posted this morning about my first hunt of the year. I wanted to dive deeper into one of the biggest reasons I feel hunting sites like the one discussed don’t yield great results for me. 1. Time- It takes hours and hours to hunt a site properly. If we hunt a site properly it requires us to make many passes from many angles to get all the non ferrous targets out of the ground. In addition there are surprises to be had when digging deep iron. So how do we combat this. I like to get standing permissions, however that isn’t always possible. If I know I have a private site secured it is much easier to make multiple trips. If I don’t have that standing permission and I think I will only get to hunt a place once I have to work quickly. Everyone knows that this doesn’t produce the best results. Old sites need items removed in layers (100’s of years of layers). 2. Response time of our machines- I am going to go out on a limb here and talk bad about the Garrett Ace 250. I love this machine but there is one thing about it that drives me crazy. Response time or recovery speed as some call it. This is the speed at which our machines see one target, processes it, and sees the next target. The Ace is slow about this. I switched to the DD coil to get better target separation and it helped tremendously however it doesn’t speed the machine up. There are two options to change this. The first is you can buy a faster machine. Secondly is to slow down extremely. Now I am a patient MDer and I can work slow but I don’t like to do it. I am hoping to get a machine with a faster recovery speed sometime in the near future. The options are buy a high end machine that has variable recovery speed or buy an intermediate machine that has a faster response time. Honestly I have been wanting to try out the Teknetics Eurotek Pro with the 11″DD coil. This machine costs $300 and from the videos and reviews I’ve read it is fast and deep. You don’t get all the bells and whistles that upper end machines have but for the money I’m guessing it would do an excellent job. I think this is especially true given the sites I hunt. 3. Coil size- If you want the ultimate in target separation you can get a sniper coil. Ideally one would have multiple coils for their machine. If I’m hunting an open field I want to cover more ground than if I’m in a small postage stamp sized yard in town. The 5 x 8 DD coil that Garrett offers for the Ace series seems to be an excellent compromise. So what’s the problem? I’m cheap and that coil costs the same amount I gave for my second hand bone stock Ace 250. I have trouble putting more money into the Ace and still having to deal with the slow recovery speed. So this is my conundrum. I’m cheap and I love the detecting hobby because you don’t have to spend a fortune to have fun. I just get the feeling that I leave good targets behind. I have proved this to myself time and time again on sites that I have standing permission on. I will hunt it 3,4, or 10 times and still pull goodies out of the ground. I am a firm believer that “masking” is the problem. I would love to get the Eurotek and place it heads up against the Ace 250. I have been using the Ace for a couple of years and I have been amazed by it’s depth, accurate target ID, and it’s simplicity. I have written several times about all it’s good sides. I remember talking to Pulltab Miner a long time ago about this and he put it simply by saying “you have reached it’s max ability”. I truly believe he is correct. The response time I believe is the only thing holding this machine back from being better than machines that cost twice to three times as much. I have always thought that the ATPro would be my next logical step but I am not convinced that the recovery speed would be that much better and I think that is the key to getting me the finds I want. Now on to some fun stuff. Pulltab Miner shared with me a blog today that I thought I would pass along. There is a lady in Tennessee that has been detecting since 2011. I am confident in saying that her finds blow mine out of the water just like her writing skills. Anyways I will happily add her to my blogroll so that others can read her great blog. Her name is Whit Hill and she goes by Dirt Girl. Take a second and read through a few of her posts. You won’t be disappointed! Here is a link to her blog. At any rate it is great that we have these kinds of social media driven groups. Let’s face it, you can’t stereotype those that enjoy our hobby. I have met people from all walks of life and ages in the hobby. This means that we have to be extremely diversified in how we congregate everyone. In the back of my mind I’ve wondered what would happen if all the older folks called each other and the younger folks texted, tweeted, facebooked, and snapchatted each other to congregate in places like Cook County. If a couple thousand people showed up at the courthouse would it make a statement? I guess that would be known as a flash mob type of thingy! Well, Yesterday I got out detecting in the afternoon. With the temperatures hovering just above freezing I knew the weather would be OK. When I finished my hunt snow was flying and the temp had dropped about 10 degrees. I wasn’t sure where I wanted to go detecting so I did some “freestyling” as I call it. I decided to drive South a few miles and then East a few miles. I knew from looking at maps previously that there were some really old homesteads scattered around the area. The first one I spotted was where I ended up spending two hours. It was an old property that looked very promising. Little did I know that this place was littered with all kinds of foreign metal objects.. I detected for two hours and dug all kinds of signals. I ended up with one clad dime, about 15 pulltabs, a few square nails, and many many pieces of small brass and copper objects. 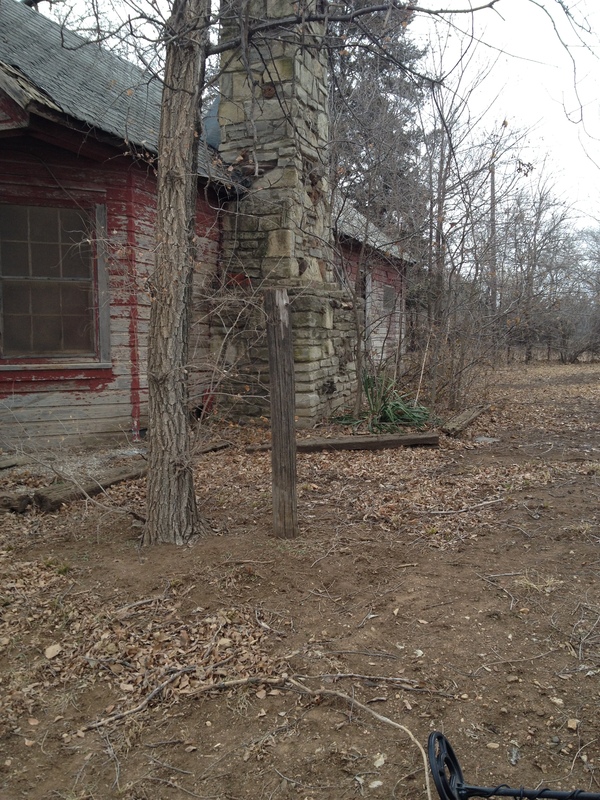 I was kind of disappointed but I have learned that when hunting rural properties there are no guarantees. I remember when I first started detecting I had made a post on the Friendly Metal Detecting Forum about gaining permission at an old farmstead. A man commented on my post saying sorry to bust your bubble but they usually don’t produce that well. In my mind I was wondering who the pessimistic man was. After a little research I learned that it was Dan Hughes. After listening to a few of his podcasts I understood where he was coming from. Sometimes you luck into coins on these sites and other times you bust. Finds aside though I love detecting these kinds of places because you just never know what you will find. I plan on going through the trash side of my nail apron to see if there is anything of interest in it. I know I dug a couple pieces of Iron that had some lettering on them. I will let you know if there is anything super cool in them. Anyways there you have it my first hunt of 2014. It wasn’t what I had hoped for but it still solidified that regardless of the treasure you find the hobby is fun.